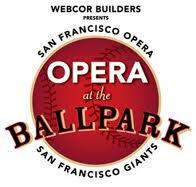 San Francisco Opera's Opera in the Ballpark event is one of the best things about living in San Francisco. I've been to every single simulcast, which the company presents once a year at the Giants' home stadium on the waterfront to tens of thousands of people for free. And it's always a memorable evening. This year's offering -- Rigoletto -- will stand out for me for a few reasons. Ok, so I don't much care for the grandiose nineteenth century Italian operatic warhorses. But this year, I decided for the first time to see the production twice: I experienced Verdi's chef d'oeuvre from the comfort of an orchestra seat on opening night a couple of weeks ago in a Michael Kors cocktail dress and Prada heels, and then this past weekend on the baseball diamond in jeans and sneakers surrounded by friends and a copious picnic. I far preferred the ballpark version to that of the opera house, even though it was freezing on the field and the experience was mediated by a large screen and a blaring PA system. In the opera house, I was of course able to hear the spectacular voices of the performers more cleanly and closely as well as the lushness of the orchestra's playing. Zeljko Lucic (Rigoletto), Aleksandra Kurzak (Gilda) and Francesco Demuro (The Duke of Mantua) are all breathtaking in their roles. Yet the warmth and beauty of the cast's vocal performances came across amply in the ballpark. And the great advantage for the outdoor audience is being able to see the singer-actors' faces and bodies up close. This simply isn't possible indoors. Even from the orchestra seats, you can't get a clear view of what's going on on the acting front on stage. Plus, there's something effortlessly warm and deeply communal about sitting on the grass with some 20,000 other people sharing food, wine and a great opera. The crowds on the diamond and in the stands clap and holler and gasp and laugh. There's freedom to move around. There's also a much greater diversity of audience members at the ballpark and it's particularly wonderful to see so many kids gazing up at the screen. Another thing I love about Opera in the Ballpark is the competition that KDFC runs every year to find a singer for the National Anthem at the start of the show. This year, the local classical radio station received some 70 entries. The winner was a Barbershop Quartet. They sang a tuneful yet harmonically quirky arrangement of the song and the crowd loved it. I think more cities should follow the San Francisco Opera's lead. Opera in the Ballpark is one of the most truly transformative arts experiences around.